SETH’S PICKS: The week of San Diego Comic Con is always one where publishers unload lots of big titles. This week is no exception. In fact, there are so many notable titles that I couldn’t limit my Staff Pick to a mere single book. Let the lightning round begin! 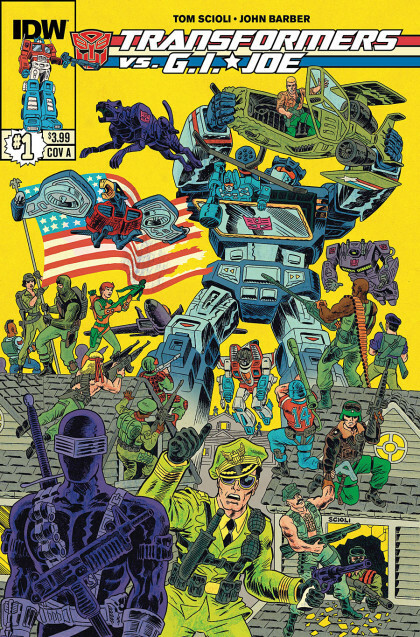 1) Transformers vs. G.I. Joe #1: As with most ’80s children, I loved both of these toy-cartoon-comics. The adult in me, however, hasn’t paid much attention to either franchise. Leave it to writer/artist Tom Scioli to be the creator to pull me back in. Aside from Scioli’s always impressive Kirby-inspired art, I must say that it was his obvious enthusiasm for this project that he displayed in conversation at HeroesCon that makes this the book I’m most looking forward to this week. 2) Street Angel HC: Jim Rugg is a creator whose work always demands attention. 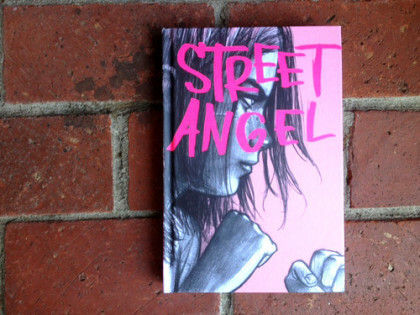 Though this is a new repackaging of Street Angel, it’s printed in a larger format than the original collection. If comics can do with more of anything, it’s larger Jim Rugg art. Plus, since this new collection is brought to you by Adhouse Books, you know it’ll be a handsome publication. 3) Avengers 100th Anniversary Special: James Stokoe writes and draws this one shot. It features future versions of Doctor Strange, Beta Ray Bill and Rogue. That’s about all you need to know about this one. If for some reason you aren’t familiar with Stokoe’s Orc Stain and Wonton Soup, here’s your opportunity to discover a comics giant-in-the-making. 4) Ragnarok #1: This is Walt Simonson’s new creator owned project for IDW. It happens to be a Norse-themed book, which we all know Simonson to excel at. I could go on, but do you really need another reason to look at this besides Simonson? 5) Supreme: Blue Rose #1: Warren Ellis writes this new chapter of the Supreme saga. While that alone will be enough to entice some readers, the art is provided by Tula Lotay. Some of you may not be familiar with her beautiful work, but you will be soon enough. Don’t forget that Lotay will be signing at Heroes next Tuesday, July 29, so make sure to pick up your copy this week. 6) Hellboy Artist’s Edition: IDW continues their barrage of epic artist editions with Mike Mignola’s Hellboy. Giant format Mignola art painstakingly reproduced from the original pages? If that doesn’t warrant a spot on your bookshelf, I don’t know what will. 7) Guardians of the Galaxy: The Complete Abnett and Lanning Collection vol. 1: We’re only a week away from the Guardians of the Galaxy film. This series was a primary influence on the new film, and since speculators have driven the cost of the single issues and original collections sky high, here’s an affordable chance to see where it all started. In my opinion, this was a fun, inventive series that never got its due when first published. Even if you don’t care about seeing the movie, I think this is the Guardians series most worth your time. We are honored to welcome Tula Lotay to Heroes Aren’t Hard To Find for her only 2014 scheduled U.S. appearance besides SDCC! Lotay, artist of the Warren Ellis penned Supreme: Blue Rose will be signing copies of this exciting Image Comics #1 at our store on Tuesday, July 29, 2014 at 12 noon. Plan to spend your lunch break at Heroes that day! Let us know you’re coming on our Facebook Event page! Tell your friends! 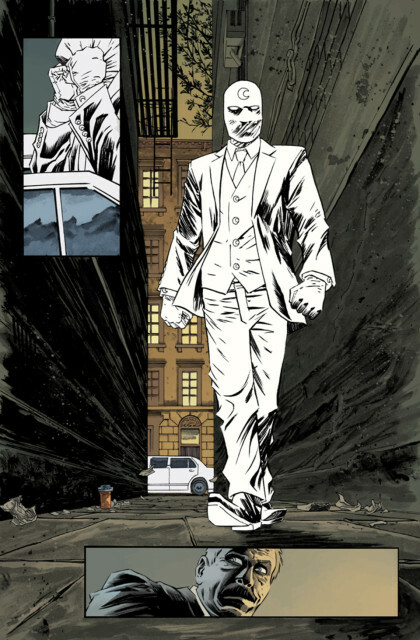 SETH’S PICK :: MOON KNIGHT #1: Moon Knight has often been treated as a multiple-personality-laden Batman of sorts. While the jumbled nature of the guy under the mask is intriguing, I’ve always been partial to the character’s horror elements. With this new relaunch, the creative team of Warren Ellis, Declan Shalvey, and Jordie Bellaire seem poised to integrate both elements of the odd character for new readers. Though you might not initially recognize the character’s new look (white business suit sans the cape), you’ll no doubt remember that Ellis does still occasionally write solid comics for Marvel. The fantastic Nextwave series jumps to mind. And it’s worth noting that Shalvey and Bellaire, though they’ve already made names for themselves in their respective areas of comic making, do seem to have an opportunity to take their storytelling to interesting new places with this character. I should also mention that this book has been building advanced buzz in recent weeks. Don’t be surprised if this one sells out quickly. 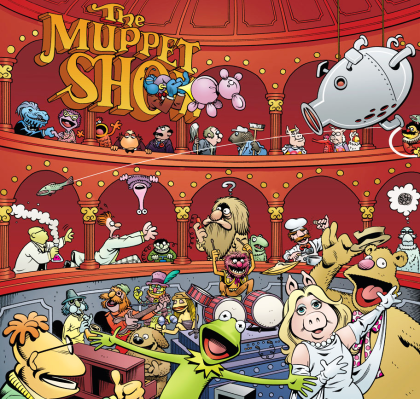 Bonus Pick: Muppets Omnibus: Over the years on this blog I’ve written at length about the genius of Roger Langridge. While his Fred the Clown will always be my favorite, his work on the Muppets is downright joyous. Aside from being genuinely funny throughout, Langridge’s art is impeccable. This summer he’ll be returning to HeroesCon, so do yourself a favor and stop by his table to bask in the awe of his original art pages. Like me, you’ll probably wind up spending your money on several of his incredible pages.